An economically-designed steel-framed leisure centre is set to provide the local community in Bradford with modern sporting facilities. One of the more active construction sectors over the past decade or so has been leisure, spurred on by the fact that numerous local authorities are either upgrading their current facilities or building new state-of-the-art swimming and sports complexes. Examples of this work recently covered in New Steel Construction include new pools in Coventry (NSC March 2018) and Rhyl (NSC April 2018) as well as a leisure complex in Littlehampton (NSC May 2018). These projects are usually built using a steel-framed solution, as economically-constructed long, clear spans are needed to accommodate facilities such as swimming pools and indoor sports halls. 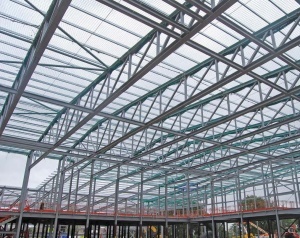 Constructional steelwork also offers a relatively quick construction programme, while flexibility can also be built into the frame, whereby partition walls can be removed to allow reconfiguration of rooms and halls. Another recent example from this sector is the Sedbergh Sports and Leisure Facility in Bradford, where Billington Structures, working on behalf of ISG, has recently completed the steel frame. The scheme is part of an ongoing investment programme by the council to replace outdated and inefficient leisure facilities, with modern, purpose-built amenities that better serve local communities and encourage greater participation in sports. The new high-specification two-storey leisure centre includes a 25m swimming pool, 12.5m learner pool with moveable floor, eight-court sports hall, 80-station fitness suite, two dance studios, staff facilities and café as well as outdoor pitches for both football and rugby. The rectangular-shaped building is arranged with the two long span areas – sports hall and pool hall - at either end. These two zones are both single-storey elements, reaching the full height of the structure, and are separated by a two-storey spine that also extends along the front elevation. The two-storey area accommodates wet and dry changing facilities, with the gym and dance studios on the upper floor. In front of the two-storey zone, the building has a full-height reception area that runs the full length of the building. Beyond this, a series of feature 219mm-diameter CHS columns supports an exterior canopy, which creates a covered pedestrian walkway. Overall, the steel frame is based around an irregular grid pattern (varying between 4.7m and 5.7m spacings) as there are a multitude of uses to be accommodated, all of which require rooms and areas of differing sizes. Cross bracing, located in the building’s corners and within interior partitions, provides the stability. “Most of the bracing is out-of-view in the completed scheme, however, we do have some feature Macalloy cross bracing which sits inside the gym’s large glazed wall that overlooks the site’s sports pitches,” says ISG Project Manager James Fryer. Prior to the steelwork programme commencing, ISG had already begun its extensive groundworks, which included digging up 50,000m3 of earth and then distributing it around the site. The plot was previously used as sports fields that were poorly drained, and frequently waterlogged. ISG is installing a new drainage system throughout the site and altering the terrain in order to create flat sports pitches on an area that previously sloped up to 8m from one end of the site to the other. The site has been lowered by approximately 6.5m to accommodate the leisure centre. All of the excavated material has remained on site and much of it has been relocated to the opposite end of the site to raise the plot’s lowest level. Billington used a number of mobile cranes, up to 70t-capacity, for the steel erection. The largest steel elements were the 45m-long trusses that span the sports hall. Brought to site in three sections, the trusses were bolted into two parts on the ground (one third and two thirds) before being lifted into place by two cranes. Once they were bolted on to their respective columns, the central splice was completed while the cranes were holding the truss sections in place. Designed to complement its surroundings on the Sedbergh Playing Fields site, the 5,100m2 building features a large expanse of glazing to its façade, with solar shading panels and timber cladding elements, as well as a striking aluminium roof design that wraps around the structure. The project is scheduled for completion in summer 2019. Summing up, ISG Regional Director Tim Harvey said: “This latest investment in community leisure facilities underscores the importance Bradford District Council places on fitness and well-being across the region. Increasing participation in sporting activities is a key aim of the new centre, as well as creating a hub that becomes a focal point for the local community, and as a Bradford-based contractor this is a great aspiration for this influential project”. The initial steel design for the Sedbergh Leisure Centre was engineered by Furness Partnership, but ISG wanted its subcontracted steelwork contractor, Billington Structures, to do a design and build on the scheme, in order to achieve a more cost-effective programme. Working with the original designs, Billington conducted some value engineering, whereby all of the column locations, beam depths and spans were all fine-tuned, making the steelwork more cost-effective. “By rationalising the steel tonnage, there were less crane lifts to undertake and consequently the overall programme was quicker,” explains ISG Project Manager James Fryer. Billington also supplied and installed the project’s metal decking, two precast staircases, a feature steel staircase and easi-edge protection barriers. All of its on-site work was completed ahead of schedule.